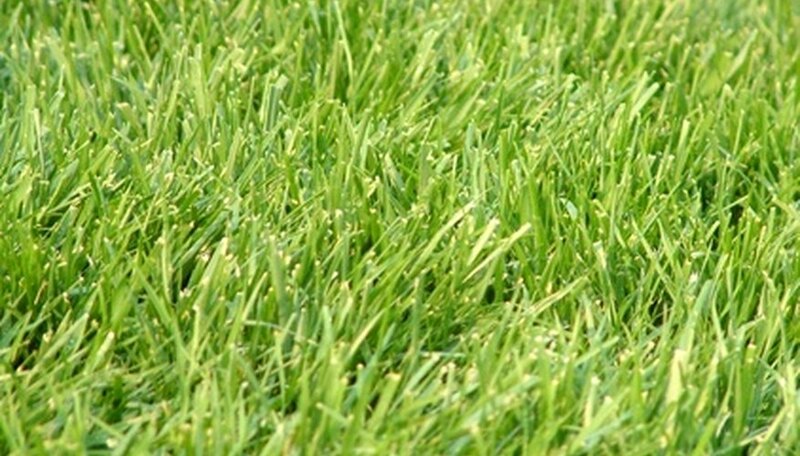 What Are the Treatments for Brown Patch Lawn Disease? Circular areas of dead-looking grass may mean you've got an outbreak of brown patch. This fungal condition flourishes in warm, wet weather and causes significant lawn damage. The symptoms resemble those of poorly draining soil causing grass roots to rot, or highly compacted soil preventing grass from rooting adequately. To be certain, look for green crowns (the base of the plant from which all parts grow) beneath brown blades. Apply a fungicide with the active ingredient Chlorothalonil (such as Daconil), which will kill brown patch fungus on contact. Another effective fungicide is Terraclor, whose active ingredient is Pentachloronitrobenzene. Best practice is to perform two or three treatments each seven days apart. Apply fungicide not only to the visibly affected areas, but also to the five or six feet surrounding the damage. Treatments will not restore green to the brown patches on your lawn, but they will beat back the fungus so that your lawn can begin to recover. Do not fertilize your lawn until after the final fungicide treatment. Afterwards, be careful not to over-fertilize. Give your lawn only a very light fertilizer application to aid in its recovery. During an outbreak, don't mow when the grass is wet, and don't leave grass clippings on the ground. The clippings will be full of the brown patch fungal spores and will reinfect your lawn. You may resume mulch mowing after successful treatment is concluded. Use Bayleton (Fung-Away) slow release formula to prevent brown patch in lawns that have had past outbreaks or are in a region that is susceptible to brown patch outbreaks. Apply at least a week or two before the season of greatest vulnerability to brown patch and reapply throughout the growing season. Do not water your lawn in the late afternoon or evening. Unabsorbed water standing on the grass all night long creates a favorable condition for brown patch outbreaks. Instead, water early in the morning. High nitrogen fertilizers also create prime fungal growth conditions, so don't over-fertilize. Apply fertilizer according to package directions, and err on the side of less rather than more. If you prefer to leave your grass clippings on the lawn, use a mulch mower that cuts these clippings into quarter-inch lengths or shorter. Longer pieces will create a "thatch" that protects and encourages fungal growth. Nicole LeBoeuf-Little is a freelancer from New Orleans, writing professionally since 1994. Recent short stories appear on Ideomancer.com and in Ellen Datlow's anthology "Blood and Other Cravings." She has published articles in "Pangaia Magazine" and eGuides at StyleCareer.com. She holds a Bachelor of Arts in English from University of Washington and attended the professional SF/F workshop Viable Paradise. What Are Fairy Rings in Lawns?